There are currently 88,676 users on this website. 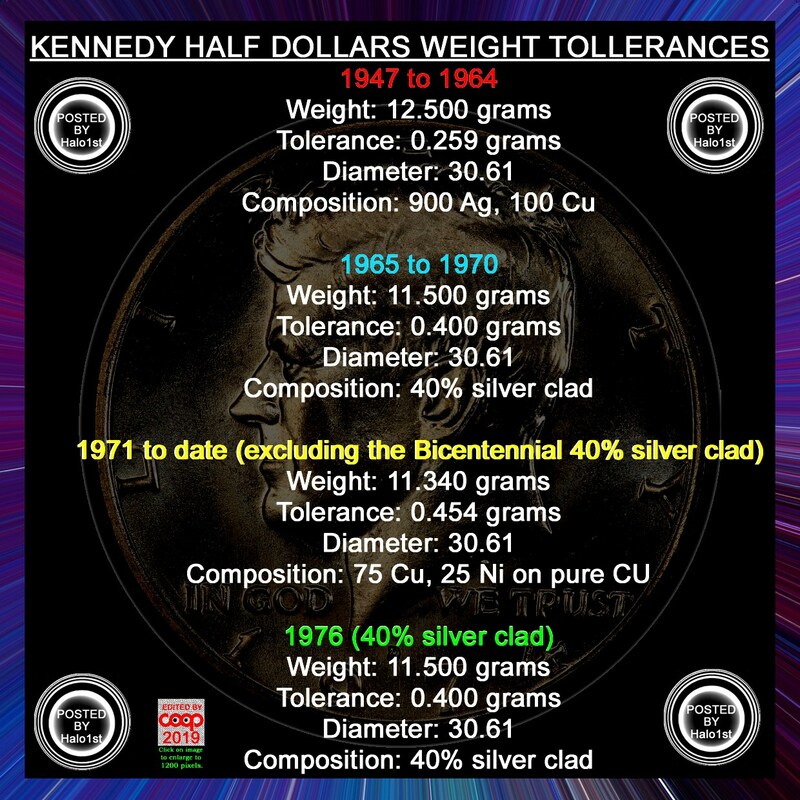 What Weight Tolerance A Kennedy Half Dollar Can Have? I start to use a scale and I noticed 2 Kennedy half dollars coins that weight way more compare with others, a 1973-D 11.44 grams and 1990-D 11.39 g.
From the same years weight 11.11 or 11.24 or 11.33 but this two seems different the edge shows copper, What are your thought? Note the tolerance shown in that other topic(s) was reference for 90% silver from 1947 to 1964. Thanks, Doug. Thank you for your time, this list will make it at lot easier to understand. Coop, thanks for the awesome illustration and recognition. Because the topic pertained to Kennedy half's, I added it above as 1964 was the beginning. Note: some 1963 David Carr examples exist. I felt I should point out, I didn't think to make reference of the others like Franklin half dollars that ran 1948 - 1963. Same weight, dimensions and tolerance. Thanks, Doug. As you get more information of other denominations, I could make a set for each. I'm glad you like it. It is easy to create these. I could create a thread to transfer them all there. So if you could post more of this information, then I could make more of these.